Rock Cottage Self-cateringBeamed ceilings, flag floors, deepset windows and a fine original period Victorian range all contribute to the character feel of Rock Cottage, which is set just off the road on the outskirts of Ambleside in the little hamlet of Clappersgate, close to the head of Lake Windermere. Coleridge's two sons lodged here in 1808 and the Grade II listed 17th century cottage offers all the comforts of home in a traditional setting. Lake Windermere can be seen from the upstairs front window. There are footpaths from the door to Todd Crag leading up to Loughrigg and fine mountain walking in the Langdale Valley is just a short drive away. Accommodation: Entrance porch with couple of steps into beamed sitting room with Victorian cast-iron range with open fire, TV with freesat channels, DVD,wi-fi , Modern fitted Shaker kitchen with up to date appliances and large table for family meals. 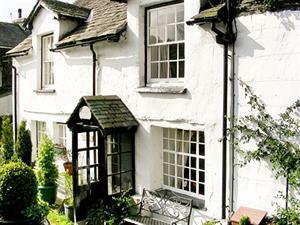 The cottage is on three floors with two double bedrooms on the first floor - one with en-suite shower, basin and wc. Separate wc on half landing. Family bathroom has bath with shower over plus basin. Further stairs to top floor family room with three single beds, pitched ceiling, cruck beams and velux window. Dressed flag floors with rugs at ground level. Furnishings are comfortable and traditional with many pictures and good fabrics. Rock Cottage is deceptively spacious and offers a cosy welcome to guests in any season. Outside: There is a garden bench just outside the front porch. A useful outside storeroom will take care of your wet walking gear and maybe even a couple of bikes. Private off-road parking for two cars about 100 yards from the cottage. Ambleside village 1 mile, lake Windermere three quarters of a mile. Rock Cottage offers weekly bookings starting on Saturday.